(Reuters | 20/8) - Sea ice in the Arctic Ocean is likely to shrink to a record small size sometime next week, and then keep on melting, a scientist at the U.S. National Snow and Ice Data Center said on Monday. "A new daily record ... would be likely by the end of August," said Ted Scambos, lead scientist at the data center, which monitors ice in the Arctic and elsewhere. "Chances are it will cross the previous record while we're still in sea ice retreat." The amount of sea ice in the Arctic is important because this region is a potent global weather-maker, sometimes characterized as the world's air conditioner. This year, the loss of sea ice in the Arctic has suggested a possible opening of the Northwest Passage north of Canada and Alaska and the Northern Sea Route by Europe and Siberia. As parts of the Arctic melted, 2012 also set records for heat and drought in much of the Northern Hemisphere temperate zone, especially the continental United States. This summer could see the ice retreat to less than 1.5 million square miles (4 million square km), an unprecedented low, Scambos said. 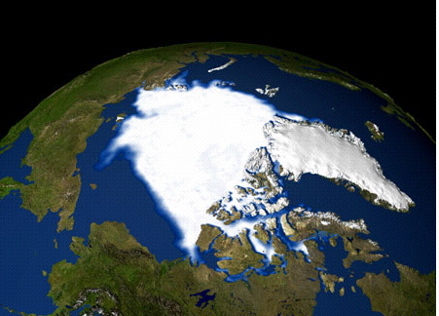 The previous record was set in 2007, when Arctic ice cover shrank to 1.66 million square miles (4.28 million square km), 23 percent below the earlier record set in 2005 and 39 percent below the long-term average from 1979 to 2000. However, 2007 was a jaw-dropping "perfect storm" of conditions that primed the area for thawing sea ice: warmer and sunnier than usual, with extremely warm ocean water and winds all working together to melt the Arctic. Last year, Arctic sea ice extended over the second-smallest area on record, but that was considered to be closer to a "new normal" rather than the extreme conditions of 2007, NSIDC said then. This year is similar to 2011, Scambos said by telephone from Colorado. The melt season started between 10 days to two weeks earlier than usual in some critical areas including northern Europe and Siberia. If the sea ice record is broken this month, that would be unusually early in the season; last year's low point came on September 9, 2011. Typically, the melting of Arctic sea ice slows down in August as the Northern Hemisphere moves toward fall, but this year, it has speeded up, Scambos said. "I doubt there's been another year that had as rapid an early August retreat," he said. Overall, the decline of Arctic sea ice has happened faster than projected by the United Nations Intergovernmental Panel on Climate Change five years ago, according to NSIDC data ( here ). To Scambos, these are clear signs of climate change spurred by human activities, notably the emission of heat-trapping greenhouse gases including carbon dioxide. "Everything about this points in the same direction: we've made the Earth warmer," he said. This summer has also seen unusual melting of the ice sheet covering Greenland, with NASA images showing that for a few days in July, 97 percent of the northern island's surface was thawing. The same month also saw an iceberg twice the size of Manhattan break free from Greenland's Petermann Glacier. The change is apparent from an NSIDC graphic showing current Arctic ice cover compared with the 1979-2000 average, Scambos said. The graphic is online at nsidc.org/arcticseaicenews/ . "What you're seeing is more open ocean than you're seeing ice," he said. "It just simply doesn't look like what a polar scientist expects the arctic to look like. It's wide open and the (ice) cap is very small. It's a visceral thing. You look at it and that just doesn't look like the Arctic Ocean any more."